The number of prisoners varied considerably. In February 1943, 600 prisoners came to Munich-Riem, at the end of 1944 there were only 300 prisoners, and by the turn of the year 1944-45 a survivor gave the figure of 100. It is certain that at the end of March / beginning of April 1945 after the evacuations of sub-camps of KZ-Natzweiler such as Neckarelz, and Moosbach several hundred prisoners were transferred to the sub-camp Munich-Riem. On April 26 there were 543 prisoners present. 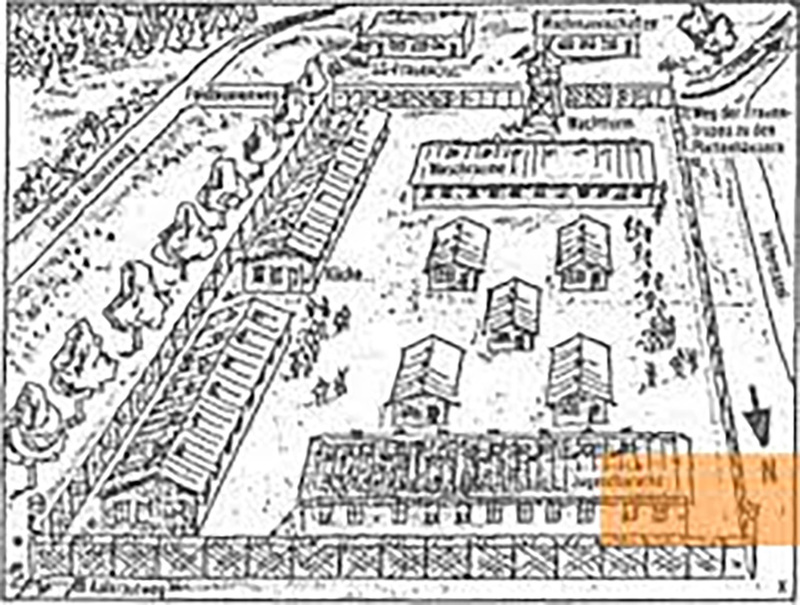 In addition to these sub-camps, Munich-Allach, was one of the largest encampment in the vicinity of Munich. In the sub-camp Riem were mainly prisoners from Russia, France, Italy and the German Reich. Among them were about 200 Sinti and Romano and a certain number of Jews. The first Kapo was the German Ludwig Müller, the camp scribe was Hans Bonn and camp leader Fritz Mannel. Both were transferred on 1 April 1945back to the Stammlager Dachau. Thus, in the last few weeks there were no prisoners functionaries in Munich-Riem. The food provided by the camp kitchen within the barbed wire fencing was described as completely inadequate by former prisoners. In the morning they were given thin coffee, at noon watery cabbage or potato soup, and in the evening coffee again with a slice of bread. 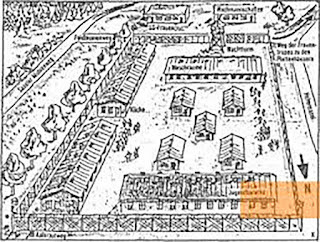 Many of the prisoners were undernourished and weakened by the heavy earthwork they had to carry out. Anyone who was sick or unable to work was brought back to KZ-Dachau, and whoever broke down on the way to the workplace was driven on by the guards without any reservations. There was no hospital in this camp. In the case of an air raid, the camp's staff was safe in shelters, but no measures had been taken for the detainees. Instead, the camp gate was opened and the prisoners were ordered to hide in the surrounding area. Anyone who did not return to the camp immediately at the end of the air raids was searched for and if apprehended, shot. The prisoners took advantage of this opportunity to leave the camp to look for potatoes in the surrounding fields or to beg for food from farmers. If the guards found foodstuffs on the returnees, those prisoners were executed without reason through the neck for alleged looting. Civilians did came to the camp administration several times to complain about theft of food stuff, while the prisoners took advantage of the opportunity to leave the camp. If the guards found foodstuff on returnees, these prisoners were shot without reason for looting. In these cases the suspects were usually shot immediately on the assembly court. In February or March 1945, 20 Russian prisoners were thus murdered. Despite these draconian punishments, there were escape attempts. The majority of them ended up by execution of the fugitives. In these cases the suspects were usually shot on the assembly court. Franz Xaver Trenkle in American internment. Recording from 1945. After the establishment of the Neuengamme concentration camp , Trenkle was appointed rapport leader there in 1940 and then probably moved to Sachsenhausen concentration camp . In November 1942, he returned to the Dachau concentration camp, where he served as rapport leader and deputy arresteer until March 1944. Subsequently, Trenkle was ttransferred to the Bergen-Belsen concentration camp until early January 1945. From January 6, 1945, Trenkle once again served as commandant and supervised concentration camp prisoners in the outer camp of Dachau concentration camp in Lauingen . From the beginning of April 1945 until the 29th of April 1945 Trenkle was commandant in the camp Flugplatz München-Riem of the organization Todt . After the war, Trenkle was arrested on 15 November 1945 for the Dachau trial , which took place within the framework of the Dachau Processes , as a war criminal by a US military court, and on 13 December 1945 for "assistance and participation in the crimes in the concentration camp Dachau "with thirty-five other co-defendants sntenced to death by the rope . In the verdict, the execution ordered by the Gestapo as well as the ill-treatment and killing of prisoners were considered as individual criminal acts by Trenkle. The verdict was death on May 28, 1946, at the war crimes jail at Landsberg. The sub-camp was not dissolved. On 24/25 April 1945, only the Jewish prisoners were brought back by trucks to the Stammlager Dachau directly from Munich-Riem and later freed on 29.4.41945 by the Americans. The majority of the prisoners, about 1,000 prisoners, were evacuated directly from Riem on the 25th of April 1945 towards the south. The prisoners marched via Trudering towards Bad Tölz, the other 500 moved across Grossheslohe, Grünwald and Deiningen to Dettenhausen. Both marches survivors described' abuse as well as shootings of prisoners who were too weak to go on. Some prisoners took the opportunity to escape and hid themselves until the arrival of the Americans in barns or forests. A small part of the prisoners were held back in the riding school. According to the prisoner database at the K-Gedenkstätte (Memorial Site) Dachau, 133 detainees were liberated by American troops in Riem. Today, the former riding school,is again used by the police as a horse riding school. Not to confuse the reader, I have translated the German expression 'Schwester' which means Sister as Nurse which is what they are, in one capacity or other, yet they are always addressed as 'Schwester' in German. (Because she missed her stop and did not have any money to pay the additional ticket to the tram conductor, she met Adolf Hitler in 1920. Its companion, Anton Drexler, founder of the DAP, paid the fare for Eleonore Baur. Through this experience, Sister Pia, as the nurse was called, became a glowing supporter of the "movement": she pasted posters, distributed leaflets, participated in meetings, hall battles and street fighting. She also participated in the "march to the Feldherrnhalle" in 1923. She had marched "in the fourth row," she said later, and even provided Hitler's injury. Like all "old comrades" who had participated in the Hitlerputsch, Eleonore Baur also received the "Blutorden" - the only woman. "Sister Pia" she took care of the prisoners of Dachau concentration camp from 1934 onwards: for some she was the "saving angel", for the others the "devil". The sub-camp Munich-Schwabing was the first commando of KZ-prisoners, which was permanently set up to work outside the KZ-Dachau control. Its structure, management and organization did not lie with the SS-WVHA and the camp commando Dachau, as with most of the later sub-camps, but exclusively with the person of Eleonore Baur alias 'Nurse Pia'. 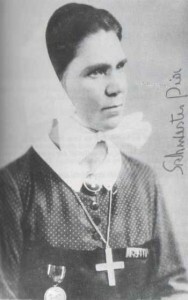 This is the famous Schwester Pia (Sister Pia), who was very close to Hitler in the early 1920’s. Her real name was Eleonore Baur. She met Hitler in 1920 and admitted to Emil Maurice in 1929 that she had been “violently in love with Hitler.” Since she was four years older than Hitler, no real relationship developed, since Hitler always preferred young and naïve women. At the beginning, the prisoners were taken to Nurse Pia at irregular intervals on one or more days a week and returned in the evening to Dachau. From 1940 a permanent sub-camp, consisting of about twelve to 14 male prisoners, was established. At first, the prisoners were taken by trucks daily from the Concentration Camp to work, but later they were accommodated at Nurse Pia's and sometimes at the weekends taken back to Dachau. The sub-camp was exclusively used by Nurse Pia, she directed the labor orders and set working hours. She was even participating in the selection of prisoners that should work for her. Under her command, hard work had to be done, not infrequently also on Sundays. The attendant SS members of the KZ-Dachau took over the guard duty. It is not known that Pia attacked prisoners, but in almost all statements of former prisoners, Nurse Pia has harassed them. If she was in a bad mood, or a prisoner did not work fast enough in her eyes, she had him, for example, descend into the sewage pit full of excrements and scrub the walls clean with a brush. At the same time, Nurse Pia was feared by the prisoners because of her great influence on the camp management. If a prisoner had fallen into disgrace with her, she did not hesitate to complain about one inmate for example and sent a criminal report (Strafmeldung) to the camp commandant's office, where the offender was given Bunker Arrest. She did threaten another prisoner that he would not leave the Dachau Concentration Camp alive, of that she would make certain. It was probably his transfer to Sachsenhausen that his life was spared. Another detainee also reported abuse after Baur sent a criminal report about him to the Camp Administration. In all, the reputation of the "commando Sister Pia'' was ambivalent. On the ner hand, the home-cooked food was well above average, the prisoners ate with Nurse Pia, and her servants together at a table. (This is typical in religious household-sic). In addition, they were allowed to smoke and had the opportunity to smuggle letters from this camp.Although Baur's unpredictability and capriciousness were very much feared. When the working commando 'Sister Pia' was dissolved,t can not be clearly stated. The International Search Service shows the last mention of the year 1942. This date, however, seems too early. Several prisoners report that they had to work at Sister Pia's place until 1944. Eleonore Baur was classified as a main culprit )Hauptschuldige) at a trial in 1949. Her assets and the villa in Oberhaching were initially confiscated, she was sentenced to ten years into a labor camp, but only served for one year. Investigations of the Prosecutor's Office Munich II of 1949 were discontinued 1950 because of lack of evidence. gBaur was arrested on May 5, 1945, and released shortly thereafter. The US Army's Counter Intelligence Corps took it up again on July 12th. 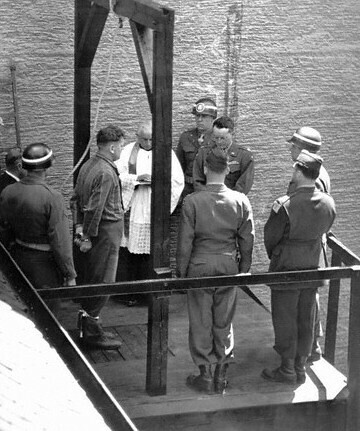 In August 1949, an investigation was initiated against members of the SS for murder . Baur admitted that three times to have participated in Rascher's subcooling experiments, which were often fatal. The court heard about a hundred witnesses. The accusation was largely based on Walter Neff's (https://de.wikipedia.org/wiki/Walter_Neff) statement that he himself had encountered it twice in experiments. The doctors Holzlöhner and Finke had previously suggested to administer a light anesthesia. She (Braur) had protested, intervened and supported Rascher. Rascher's experiments were then carried out without anesthesia. Finke said that she had nothing to do here, and she had left the room. The First Criminal Court of the Munich District Court came to the conclusion that "the evidence of an aid to a crime of murder, bodily injury with death or dangerous bodily injury is to be considered as insufficient". Independently, a second charge was filed against them under the "Act for the Liberation of National Socialism and Militarism" within the framework of denazification . The main chamber heard 44 witnesses . The statements revealed a contradictory picture. She had not committed any active crimes, but she took advantage of the labor force of the prisoners in her villa She was a glowing national socialist and anti-Semite, and had used her relations to the highest party levels to frighten neighbors and acquaintances. A neighbor, Maria Hohenester, was denounced in a seven-week investigation. Statements described her character as being unpredictable, moody, hysterical. A witness described how she participated in the schilling malaria experiments. Another witness, Alois Siegl, described her as a "seldom noble and kind woman," as she put the Kapo Deiner, who had replaced Siegl before. Moreover, in 1943 or 1944, Himmler had made the point that SS camp leader Kampe would be relieved, since he was too raw. This happened, but Himmler had forbidden her access to the camp. The SS man, Rudolf Wirth, who was assigned to her as a chauffeur by the end of February, confirms that she was no longer allowed to enter the camp from about 1943 onwards. He stated that Baur had tried to smuggle out letters of female prisoners. 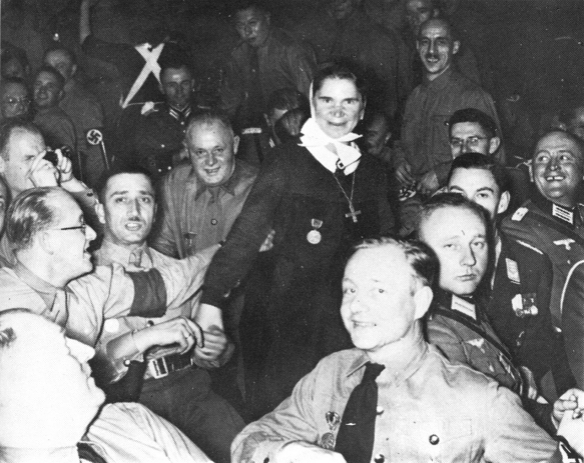 Another witness stated that Baur had been with them by most of the SS leaders, and that she had a picture of her in the wine cellar, "Sister Pia, our best SS man." 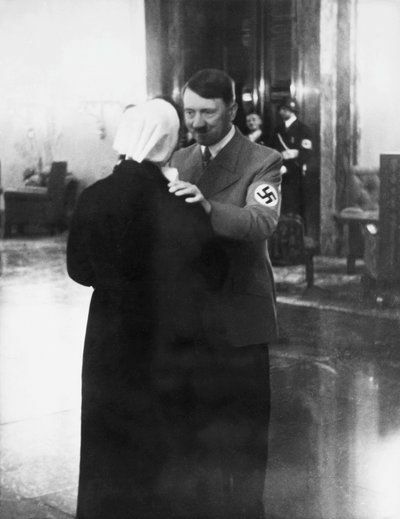 Her housekeeper, Carolina Neulein, reported that SS leaders were frequently visiting the villa, partly also the SS chapel, and also that Baur liked to say: "There is only one Frederick the Great, there is only one Adolf Hitler, there is only one sister Pia. "The most positive testimony came from German and Austrian clergymen. They stated that by ther position of power she had helped a few prisoners, mostly parishioners from Germany. She had brought them bread and tried to release some of them. Polish clergy were excluded. On the 26th of August, 1949, she was sent to ten years of denazification in a Arbeitslager (Labor Camp) , which was the shighest punishment in the denazification law [although this law existed only for four years-sic], as well as the loss of her civil rights and the confiscation of its possessions up to a residual amount of DM 1,000. She appealed . The Appeals Court reduced the sentence to eight years on 20 February 1951, which had no consequences. Already in June 1950, eight months after the verdict, she had been released from prison for health reasons. She returned to the possession of her villa. Later, she filed a motion for prisoners of war compensation. Whether this has been granted is not apparent from the file. Over thirty years later she died in 1981 at the age of 95 years. In Munich's Mercury , a death declaration of the comradeship Freikorps Oberland / Bund Oberland appeared with the slogan " Your honor was called loyalty - your life was Germany". The ad signed by Deputy Fridolin of Spaun On her grave cross in Deisenhofen is written: "Sister Pia, a life for Germany". The company Dyckerhoff and Widmann, founded in Karlsruhe in 1865, opened an office for the production of concrete in Munich. During the Second World War, it was an important concrete producer for the war industry. Among other things, the construction of two aircraft halls was started at Munich-Riem in 1938, and 9,000 square meter of shale fencing were built for the BMW facilities in Munich-Allach in 1940/41. In Munich-Freimann, the company Dyckerhoff and Widmann erected barracks about 500 meters next to the SS garrison at Ingolstädterstrasse 93, for the contract of the expansion to the existing barracks. From September 9, 1942, 25 Polish, Czech, German and Yugoslavian prisoners from KZ-Dachau were deployed on this construction site. Four weeks later the commando was increased by a further ten inmates. The prisoners had to work up to twelve hours a day and were driven on by the SS crew to peak performances. They were also abused for minor offenses. There was no medical treatment from the consequences of occupational accidents and torments. On Sundays, the prisoners were used for maintenance work within the garrison. The prisoners were accommodated within the SS garrison spread over several rooms with barred windows. Armed SS guards were posted in front of their accommodation. The prisoners were not allowed to move freely within this area. The sub-camp's guards consisted of a commanding officer and a few SS members from the Dachau concentration camp. During the work, the prisoners were accompanied by SS guards from the garrison. Names of SS-members from this sub-camp are not known. Among the prisoners, there were three Kapos, Karl Rapp, Erwin Görlich and David Feigl. When the construction work was completed, the sub-camp was disbanded and 24 prisoners returned to the KZ-Dachau on the 10th December 1942. Since 1927, the German Reichsbahn operated a repair shop at Frankplatz 19 in Munich-Freimann to maintain electric traction locomotives. In addition, the entire freight car repairs were carried out here. According to the International Search Service in Arolsen, the sub-camp Reichsbahn Maintenance Plant-Freimann existed from 28 March to 19 April 1945. But already during 1943 prisoners from the KZ-Dachau worked in the Maintenance shop. Information on the prisoner's strength varies between 20 and 1,200. The prisoners were used for the repair and maintenance of locomotives. They did not live on the premises, but were taken daily by train from Dachau to Freimann, and returned to the KZ after a twelve hour shift. The guard teams were composed mainly of ethnic German SS members (Volksdeutsche). 30 SS posts had been transferred from the sub-camp Gusen of the KZ-Mauthausen to this commando. The commandant is unknown by name. 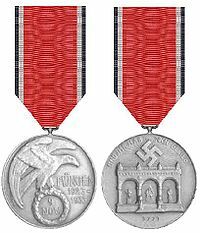 In 1944 the Polish prisoner Gustav Tillmann was appointed as Kapo. From the Central Office of the Landeskustizverwaltung (District Justice Department) during 1973 initiated investigations, which were discontinued 1974. The site is still used as the Maintenance Plant for the German Federal Railroad. From the 19th November 1941 there were in the local SS-Administration Building at Ingolstädterstrasse 193 in Munich-Freimann, 27 prisoners used in the sub-camp within the administration building. The first prisoners were 'Protective Custody Prisoners' (Schuzhaft Häftlinge), the majority came from Poland, some from the German Reich and Czechoslovakia. The composition of the inmates changed several times over the following years, but strength wise, it remained the same. The prisoners had to carry out various activities in the garrison area, such as carpentry and re-roofing, dig wells, mainly remove debris and clean up their assigned area. Four of them worked in the cauldron of the barracks. , Several times, the prisoners went to Munich to pick up clean laundry for the SS members, or to make other errands. On the weekend they had to clean the accommodation of their SS guards. After ten or twelve hours of work, the prisoners were locked up into several rooms on the third floor of a house inside the garrison. 1944 parts of the SS-barracks were destroyed in an air attack and from then on the prisoners had to be kept in a garage. While in the sub camp Richard Gerlich from Breslau was made Kapo. There were no other detainees that became functionaries. The first commander-in-chief, was SS-Scharführer Ernst Wicklein. In February 1943 followed, SS Hauptscharführer Josef Neuner, and in June 1943 SS Hauptscharführer Josef Remmele. The SS-Hauptscharführer Johann Reiss was Commanding Officer from July 1943 to January 1945 in the sub camp, the last commanding officer is unknown. Furthermore, SS-Guards were used to guard the prisoner within the barracks. The main reason for this is that the prisoners had been able to carry out various activities in the garrison area, mainly clean up debris on the ground and in general keep the place tidy. Several times, the prisoners went to Munich proper to pick up clean laundry for the SS members, or to make other errands. On the weekend they had to clean the living quarters of their sixteen SS guards (a rather high ratio to guard 27 low risk inmates,sic), these were mainly ethnic Germans from Rumania. Reports from survivors testify to abuse by the commandant Johann Reiss. In the summer of 1943 a Russian prisoner was hanged in the barracks because he had stolen food in the cellar. 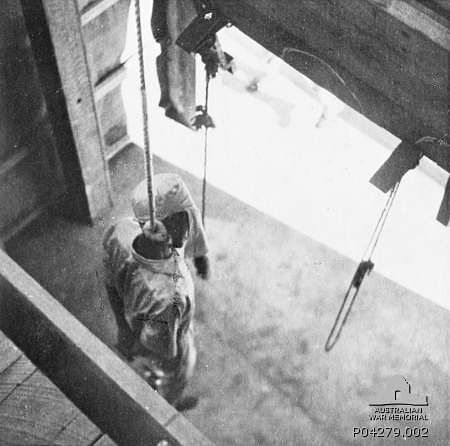 The working commando had to go to watch the execution and one of the prisoners was forced to put the sling around the neck of the condemned and then push the chair away. The corpse was rearranged and sent to the KZ-Dachau. In the third week of April 1945, the prisoners walked on foot to their Stammlager Dachau and from there on to the evacuation march southward. The former commandant, Josef Neuner, was sentenced to death in the Dachau trials and hanged in Landsberg. The American military court imposed a five-year prison term on Johann Reiss. In 1973 the central office of the Landesjustizverwaltung in Ludwigsburg initiated an investigation procedure about crimes in the sub-camp Munich-Freimann, the proceedings against Johann Reiss because of suspicion in killings at the sub-camp, yet it was was stopped 1976, as no substance of deaths could be proven. Today the barracks are used by the Bundeswehr. In 1903, Dr. Anselm Kahn and Dipl. Ing. Franz Witmann acquired the Chemical Factory Otto Bärlocher, founded in Augsburg in 1864. They moved the factory seat together with production lines to Munich. Especially after the First World War, they expanded their product range and produced sulfuric acid and ammonia, artificial fertilizer, shoe polish and detergents. In 1938, the chemical plants were aryanized to Franz Wittmann by the forced sale of the business shares by the Jewish owners. During the war, the production of industrial coal-fired lighters, of which the main customer was the German Reichsbahn, this ensured the existence of the Chenische Werke GnbH Otto Bärlocher. At this sub-camp at Siemensstrasse 16, between 1 November 1944 and 14 April 1945, about 26 to 32 prisoners were deployed. Today the Siemensstrasse has disappeared from the map. It originally started in Munich-Moosach from the Manteuffelstrasse over the Gärtnerstrasse to the Polkovenstrasse .Survivors are not aware of any reports about this sub-camp Chemical Factory. The International Search Service in Arolsen also has no transport or transfer lists from Stammlager Dachau to this camp available. [The company group Baerlocher has 13 production sites worldwide. Research and development are headquartered near Munich, France, Italy, the USA and India. Overall, Baerlocher is represented in more than 40 countries. In 1947, Dr. Christian Rosenthal took over the Otto Baerlocher Chemical Company founded in 1823. From 1980 to 2004 the family business was managed by Dr. Michael Rosenthal. In 1998 the move followed from Munich to the surrounding area, to Unterschleißheim. So that international trading partners do not stumble on the "ä" in the company name: The change of name was made inti Baerlocher. The sub-camp Oberföhring was mentioned for the first time on April 1, 1944, by the International Search Service Arolsen. A former inmate remembers that in the autumn of 1944 he and six other prisoners were transferred from the sub-camp Sudelfeld to Oberföhring. Official employer was the construction management of the Waffen-SS and the police. The task of the prisoners to be performed consisted in cooking and cleaning up as orderlies for SS members and officers of the Wehrmacht, who were billeted in a villa. The exact location of the sub-camp is unknown. According to a report by the KZ-Dachau, there were still five prisoners in the sub-camp as at 3 April 1945. These had been interspersed in a room of the villa and were guarded in an adjoining room by an SS-Watchman. In this camp, besides Germans and Poles, Russians, Frenchmen and Belgians, as well as at least three Austrians, who, on account of their faith as pacifists had been retained under the Protection Law (Schutzhaft) at KZ-Dachau being members of the religious community of Jehovah's Witnesses. The food of the prisoners was delivered by the KZ-Dachau and prepared by the prisoner cook Kurt Rupelius. At the end of April 1945, a truck took the prisoners back to the main camp (Stammlager), from where they were heading south with an evacuation march.